Registering to the online labs is easy and free. The registration process includes just a few simple steps. You need to enter an email address that will be used as your username and as a means communication with you. Your personal information includes your name, phone number, age group, gender, and other professional / educational information. 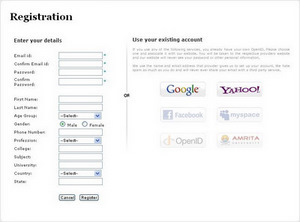 If you use any of the services such as Google or Yahoo, you already have your own OpenID. You can choose your account to login to our website. We assure you that our website does not save your password or other personal information. We use the name and email address that the provider gives to set up your account. We hate spam as much as you do and your personal information will not be shared, exchanged or transferred to any third party service providers. Individual registrations to the site are very easy. Once on the registration page, follow the registration procedures to complete your registration online. Click here to register.